Any historical discussion of women (and American women in particular) usually includes the idea of a woman’s sphere–the area in which it was socially acceptable for her to act and effect change. In high school history class, this always bugged me: wait, women have an area in which we’re permitted to act, but it’s glass-enclosed? Whereas men can set their minds and hands to anything they darned well please? Totally unfair. (And especially annoying when the teacher is male, but there you go.) Forget the glass ceiling–this puts women in glass bubbles. Despite the use of the phrase “sphere of action” in this chapter, I have to say this is one of my favorite parts of Daughters in My Kingdom–and the core of my love for Relief Society in general. The wording is grounded in another era, but the idea is forward-looking, bold, revolutionary. Here’s why: I think the restored gospel is, at its very center, feminist. We have a lot of misguided practice and now-ingrained tradition to wade through, but remember that Joseph Smith was concerned about bringing all of the saving ordinances to men and women; that when he organized the Relief Society he switched the women’s own written constitution for “something better,” which was a presidency with the right to revelation from God; that Eliza R. Snow recorded his words at the formation of the Nauvoo Relief Society as “I now turn the key to you in the name of God”–signifying that the women in this endeavor held the keys necessary to do the work. So as you begin this lesson with the sisters in your ward, remind them that these were women who had asked for a philanthropic society to clothe the men who were laboring on the temple, and what they got was essentially a commission to go and do good in any area they felt inspired to address, and a structure for their organization identical to that of the other priesthood quorums Joseph had instituted. DIMK attributes the reorganization of the Relief Society–twenty-five years after its founding!–to Brigham Young. But we really need to give most of the credit to Eliza R. Snow, who took detailed minutes as RS secretary in Nauvoo, and knew what the society meant for LDS women. In fact, it would be completely appropriate to begin your lesson with a discussion about the importance of records. If you didn’t write it down, everyone could just forget that it happened. What did this mean for Relief Society women in 1867? What does it mean for Relief Society women in 2013? Now: GO CRAZY. Remember that “wide and extensive” quote? Have someone re-read it out loud, and start asking more questions. What does “wide and extensive” signify in 2013? Even better, what should it signify? As you gather ideas from the class, help them to push the envelope. If someone mentions that contemporary women should be involved in the political process, ask her if that extends to running for office. Ask if it extends to campaigning for women’s rights both at home and worldwide. Similarly, take “charity” out of the ward context and into the context of a worldwide church. If you feel so inspired, share some information about Judy Dushku’s work with child soldiers in Uganda with your class. If someone mentions self-reliance, spend some time discussing the difference between self-reliance in 1867 and self-reliance in 2013. Canning peaches and having a year’s supply of food are good and noble things to do. But self-reliance in the present day involves non-food expenses that are best addressed by modern economic means. Families need housing, transportation, medical care, and education. Are women in a position to take on these challenges? “Teaching” is another big topic. You’ll get “teaching our children the gospel” answers, but hold out for the good stuff: women serving missions, women as researchers and professors, women as journalists and anthropologists. Ready to go for the brass ring? 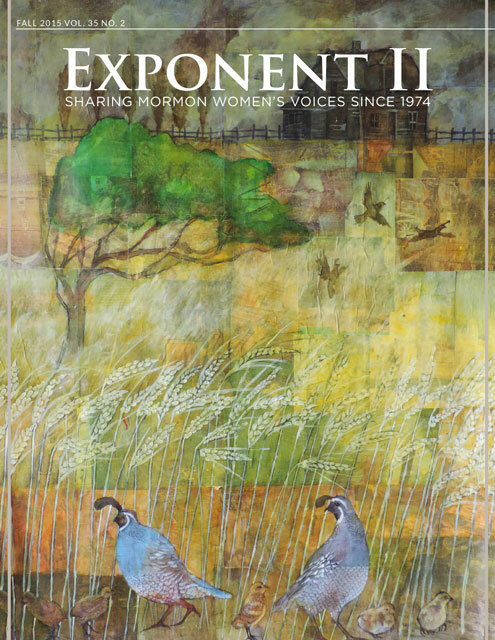 Elicit a mention of Exponent II, where women share their Church experiences, expound upon the scriptures, and ponder the meaning of true religion. And now you’re eating into closing-hymn time. End with the idea that our “sphere of action” includes anything we feel it should include. As a worldwide church, we have a world full of problems to work on, and it is our privilege and our calling to roll up our sleeves and do that work. In a strange and almost quaint pattern, Mormon women tend to wait for a formal calling before we act. The commission we were given at the establishment of the Relief Society does not hinge upon an official calling in a Church capacity. The key is ours. We have the power to do with it what we need to. Any limitation we see isn’t a curved wall of a glass bubble; it’s a barrier of our own imagination. Now go out there and do some good! Guest Post: Are We Just Preaching to the Choir? Wahoo Libby! I want to be in your class! I feel so pumped after reading this! Let me be in your class, too! An inspiring lesson, Libby! Another helpful place for examples of Mormon women engaged in a wide and extensive sphere of action can be found at Mormon Women’s Project (http://www.mormonwomen.com/). So glad you link MWP here! I have found the stories there so inspiring, empowering and validating that other women, like me, have felt called to a wide range of activities in their personal and professional lives. This is beautiful, Libby– thank you so much– this chapter has really come to life with the points you have brought up– I want to be in your class too!!! I love you, Libby. This is so, SO good. I especially love, “So as you begin this lesson with the sisters in your ward, remind them that these were women who had asked for a philanthropic society to clothe the men who were laboring on the temple, and what they got was essentially a commission to go and do good in any area they felt inspired to address, and a structure for their organization identical to that of the other priesthood quorums Joseph had instituted.” And: all of your talk about Eliza and her records. She is priestess among women. Libby – this inspired me to scrap my YW lesson for this Sunday and– since it’s the 171st anniversary of the founding of the RS– teach my Laurels this lesson about what will be part of their future in the Church in just a few months to a few years. Wow! Let me know how it goes, please. I’d love to hear the Laurels’ perspective. I too want to hear the follow up! What I wouldn’t give to be apart of a class receiving this lesson… Do me a favor? Next time there is a gathering of Mormon feminists at a retreat, conference, symposia, etc. video record this lesson being given so we can all be edified with a real world example of this kind of discourse between sisters. You may have also inspired me to ask my R.S. President to conduct a series on DIMK and volunteer to teach this lesson. Jenne, come to a retreat! Consider this a personal invitation — I’ll be at Midwest Pilgrimage next month and at the Exponent II retreat in September. Every single workshop is like the best RS lesson ever. Ha! I was reading this post while doing research for a DIMK lesson I’m teaching tomorrow night and didn’t realize it was written by my dear Libby! So glad I know you and that you put your great brain to work on these important issues. I know this post is a couple of years old, but I found it while researching to teach this lesson in our R.S. meeting tomorrow, and I am so PUMPED! Thank you so much for your insights and encouragement. I followed your comment to this great article. Thanks, Rachel, and thanks to Libby for a great post!